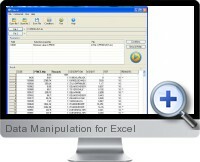 Data Manipulation for Excel makes data manipulation tasks in Excel fast with features such as finding unique and duplicate rows in table data or modify, filter and sort excel cells in seconds. Data Manipulation for Excel also eliminates the need for tedious Excel tutorials for working on tabulated data such as reports, analytics, stock taking, accounting etc. Data manipulation tasks in Excel are processed with less effort ever possible. Find unique values between two Excel spreadsheets. Find duplicate values in Excel spreadsheets. Modify column data in batch mode. Reverse row order Excel (swap rows). Built-in help and uninstall support.